If you aren’t growing as a leader, you are dying as a leader. So how can a leader assess the areas that they need to grow in? There are many different ways of looking at this, but one tool that is very helpful is something I call “The Leadership Cultivation Matrix”. 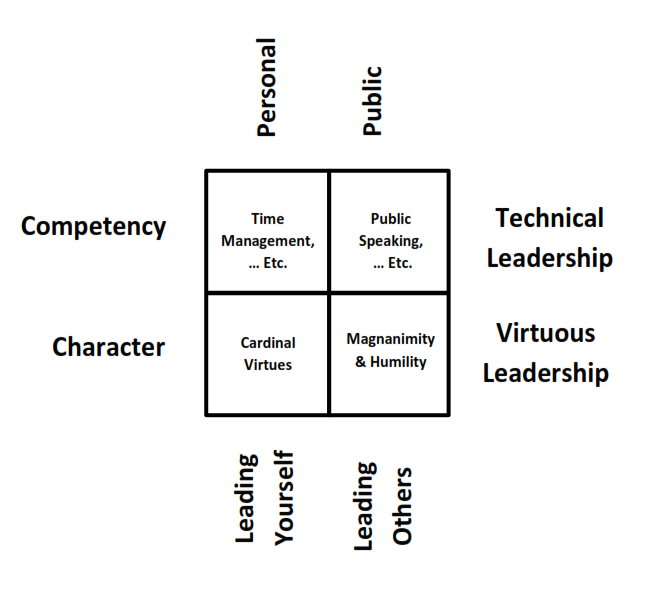 This matrix offers a perspective on the foundational building blocks of leadership. It’s a framework for considering the dimensions vital to effective leadership. When considering leadership, one can divide it into two over-arching dimensions: Leadership Character and Leadership Competency. Leadership Character can be understood as “who a leader is” – their character, their virtue, their way of being. In this dimension, we use particular traits to describe a leader’s character. They are courageous, kind, wise, diligent, etc. Leadership Competency can be understood as “what a leader does”. This includes the technical elements of leadership, skills and abilities. In this dimension, we would include things like management, planning, communication, delegation, etc. Leaders must seek to develop and grow in both of these dimensions in order to be effective, but one of the most important decisions any leader will make is which one will they place as the foundation of their leadership. Will it be a foundation of character or competency? Virtue or technique? Virtuous leaders recognize that “what I do” is often a deeper reflection of “who I am”. As such, to truly be the most effective leader that they can be, they choose to set character and virtue as the foundation upon which competency and technique are built. However, in today’s world, character is often forgotten or ignored, resulting in some leaders who blindly base their entire leadership approach on technique. Thus some leaders build a resumé of certifications and skills, forgetting that leadership is fundamentally about people, and people are living, breathing, dynamic beings. The cultivation of Leadership Character involves teaching and forming virtues within leaders that give them the capacity to be flexible and adaptable in a variety of dynamic situations or circumstances. Therefore, while both dimensions are important for a leader to develop, character and virtue remain the true solid foundation for enduring leadership. 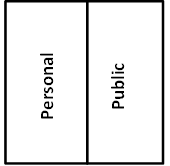 With this foundation established, we can further consider two additional dimensions, perhaps better described as “domains”, necessary for leaders to develop: the Personal and Public domain. The Personal domain is summarized simply in how well you lead yourself. This may include your interactions with others, as none of us live in complete isolation, but it is how you react and respond in self-leadership. The Public domain more specifically relates to leading other people. It is the influence we have with others to move in certain direction, work together for a common good, change people’s minds, or help them to grow and develop. Personal Leadership Character – developing the key virtues related to leading yourself. In this area, one would focus on developing the fundamental virtues, also referred to as the cardinal virtues (hinge virtues): prudence, courage, temperance, and justice (read more about these here). These form a personal foundation for leadership. Personal Leadership Competencies – developing the important skills and techniques related to leading yourself. In this area one would focus on things like personal time management skills, energy management skills, life balance, etc. There are a variety of valuable tools and techniques that can significantly support your ability to lead yourself. Public Leadership Competencies – developing the important skills and techniques elated to leading others. In this area, one would focus on things like strategic planning techniques, public speaking skills, conflict management techniques, effective meeting techniques, etc. These are also critical tools needed for the leader to achieve their mission and goals. All four of these areas in the Leadership Cultivation Matrix are vital to enable a leader to reach their full potential. But sometimes it is hard to know where to start. That’s the value of using this tool. It can help break things down for the leader who wants to grow. In looking at each quadrant, you can assess which area you are currently the strongest in and where you are you weakest. 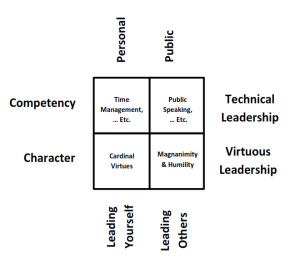 You can also intentionally cultivate your leadership by developing each of the quadrants. Where do you fall in the Leadership Cultivation Matrix? And where do you need to improve? Make a plan to take one step forward in one area to strengthen your leadership today.